I am not really enamored by celebrities, but when I found out that one of our friends at church is the Dave Stewart, I must admit that I was flabbergasted. For those not in the coffee industry, Dave Stewart and his brother, Jim, were the founders of Seattle’s Best Coffee (SBC). Having been an owner and operator of an espresso cart in the late eighties when SBC was king of espresso in Seattle, I was delighted to talk shop with Dave when we first met. (Our wives, who have been in Bible studies together for years, introduced us one Sunday.) My wife, The Mindboggling Mrs. Miyoshi, later said he was just Dave. She did not understand that talking to him was like talking to royalty. When I said, “He is the Dave Stewart,” she rolled her eyes. I tried to explain to her that it was like the time when she told Cuba Gooding Jr. she loved him (that is another story, which I apparently still need to tell). She understood the reference, but still rolled her eyes. Apparently, brother Jim parlayed his position at SBC and his expertise into at least local fame and modest fortune when SBC was bought by Starbucks in 2003. Dave just wanted to do what he loves. Roast coffee. Which is what he is still doing all these years later. It has been a year since Dave first invited us to go to Vista Clara Coffee in Snohomish, but we finally got there over the Christmas vacation. We toured the small roasting plant where Dave roasts his blends three times a week and delivers or sends that beloved product the next day. 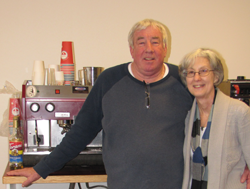 It is an amazing operation that he and his wife, Joan, operate with just a few part time employees. And the coffee is amazing. It needs to be. After all, their label says it all: Vista Clara Coffee, Roasted by Dave Stewart. We spent several hours with the Stewarts just visiting at their plant. The Mindboggling Mrs. Miyoshi enjoyed her very first cup of espresso (she is a tea drinker). I was happy to hear Dave echo my sentiments that he rarely if ever buys a cup of coffee. My Americano was smooth and rich like I remember from my own espresso days. I was amazed at his personal touch of adding brown sugar. And I was delighted to be treated to a little history of Dave and Jim Stewart and their beloved coffee. Hearing about The Wet Whisker in Coupeville on Whidbey Island where Jim and Dave started an ice cream shop, which they expanded to include coffee, made me want to know more. Dave said that they eventually had twelve shops in the Puget Sound area. Somewhere in there, they became Stewart Brothers Coffee and then Seattle’s Best Coffee and started roasting their own coffee blends. I was amazed to hear Dave talk about creating his own blends. He knows the tastes of the different coffees he buys from around the world and sometimes in the night he comes up with different recipes. Dave is an expert in the coffee industry and it was fun to hear Joan talk about a tribute to Dave and Jim at The Wet Whisker a while back. The brothers told stories about their life in coffee and others shared stories about them too. Like most amazing people I know, Dave does not bring up his own accomplishments. He is humble and people near him do not necessarily know that this man helped bring gourmet coffee to Seattle and beyond. The Mindboggling Mrs. Miyoshi said that they ought to make a movie about Dave and his exploits. I just told him that he ought to write a book. Or let me write one about him. Regardless, I am happy to know such a wonderful couple as the Stewarts. Even if my wife makes fun of me when I think of him as a celebrity and say that he is the Dave Stewart.